Once again we're at a place, which mainly benefits from screen size and resolution. Browsing on the go has never been sweeter than with the 6" Lumia 1520 and 5.7" Galaxy Note 3. Both have high, 1080p resolution screens, ensuring that text and content will remain sharp even at low zoom levels. However there are subtle differences in execution on both. 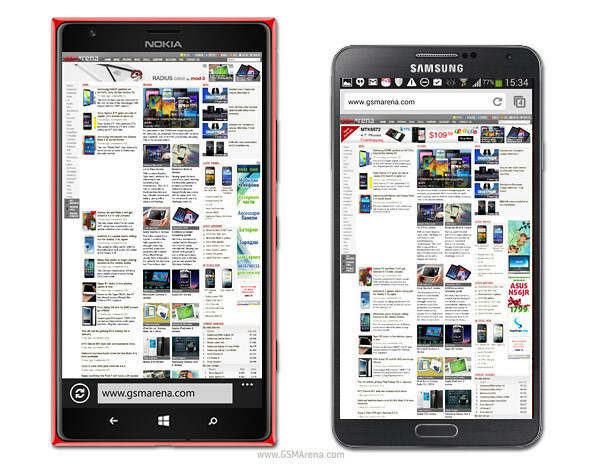 The Nokia Lumia 1520 relies on the Internet Explorer for mobile to browse the web on. When you open IE, the status bar automatically hides but the URL bar stays permanently on top. It doubles as a search field that will prompt Bing with each enquiry. The Samsung Galaxy Note 3 has a built-in browsing app courtesy of Samsung and Chrome by Google. The default app also has a persistent URL bar and also hides the status bar. However Chrome does nice to remove any trace of itself as soon as you begin zooming and swiping on the page, leaving more screen estate for the content. What could be viewed as a deciding factor is the screen size. The Nokia Lumia 1520 has a bigger display but that's offset by the always visible Internet Explorer URL bar, which isn't a problem for the Galaxy Note 3 with Chrome. When it comes to gaming, the provided hardware is the most important thing. 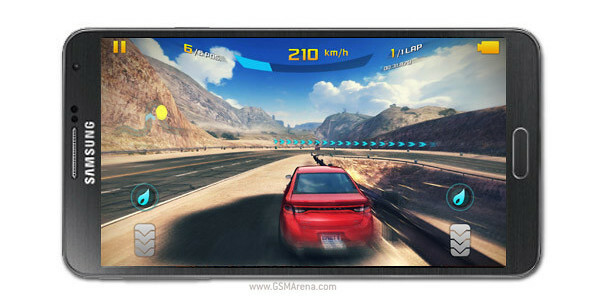 But in this case, the ecosystem plays an almost equal role because many games you could enjoy on the Samsung Galaxy Note 3 are not yet available on the Windows Phone-clad Nokia Lumia 1520. 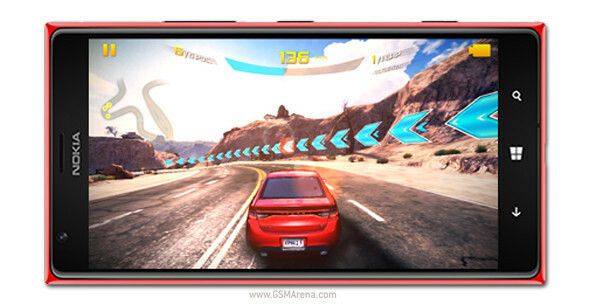 All the major players are there - Asphalt 8 is available on both, Angry Birds, The Amazing Spider-Man, etc. But many like Plants vs Zombie 2 and Fieldrunners 1 and 2, etc. cannot be found on Windows Phone just yet. So we'd have to give a big edge in this particular fight to the Samsung Galaxy Note 3. Now as far as hardware goes both devices are almost on par. They share the same chipset (non-relevant: with different clock speeds) that has the same graphics unit - the Adreno 330. What makes a difference is the screen size and overall body size. 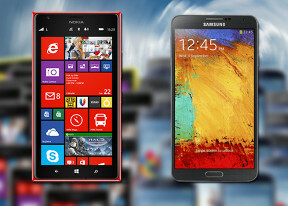 Although the Lumia 1520 is bigger than the Galaxy Note 3 we wouldn't say it's less comfortable to play on in landscape. However moving onto portrait-styled games and the Galaxy Note 3 is a better fit, mainly because of its grippy body and lower weight. Still, we come back to the ecosystem - here it's the deciding factor. The Nokia Lumia 1520 has a very decent game support as of now and we're sure it will only get much better with time. But Android gives the definite edge to the Galaxy Note 3 - only iOS could boast with better games support against Android on handheld devices. Winner: Samsung Galaxy Note 3. The Lumia 1520 comes with HERE Drive+ offers free, life-time voice-guided navigation anywhere in the world. All you have to do is download a voice in your language of choice and you're good to go. Of course, to make use of the key selling point of Drive - offline navigation - you have to download a map for a country of your choice, too. With Drive+ you can easily plan routes offline and you can tweak various settings for each route - fastest/shortest/economical route can be selected and you can choose whether the app will use or avoid motorways, toll roads, ferries, tunnels, unpaved roads and motor trains. There are icons to remind you of the selected settings. We do miss a few options - like setting a starting location other than your current location and downloading maps for an entire continent. Nokia Maps takes on other duties - instead of navigation, it's more of a replacement for paper maps that you take with you as you explore a city. It will help you discover new places, read a quick description, see photos, read reviews and check what renowned guides like Lonely Planet, Insight Guides and Qype have to say about it. The Galaxy Note 3 comes with Google Maps and Navigation. Voice-guided navigation has become a viable solution since the v5.0 update. Vector maps are smaller and easier on the data traffic and rerouting is an option if you go off course without the need to connect to the Internet. In fact, the only time you need a data connection is when you initially plan the course - Navigation will cache the needed maps. However compared to Here's much more advanced system for caching and pre-loading maps, Google Maps is a letdown. On the positive side, Google Maps supports the Street View mode. If it's available in the area you're interested in, you can enjoy a 360-degree view of the surroundings. When the digital compass is turned on it feels like making a virtual tour of the location. There's also very good POI support and search on Google Maps but it doesn't make up for the lack of true offline support. If Google Maps Navigation doesn't do it for you, you can grab an alternative app from the Android Market - there are both free and paid ones - but there's no going around the fact that Nokia has the better location services out of the box.